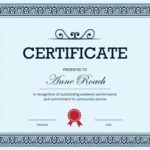 Whether you’re teaching a class of second graders or leading a high-powered corporate team, certificates of achievement, merit, and honor can be heartfelt, sincere, and personalized ways of saying, “Thank You.” Downloadable and easy to print, these award certificates are a convenient way to acknowledge others’ successes or show your appreciation for their efforts. Though it seems counter-intuitive, money isn’t always the most effective award. A study by Barasch, Small, and Berman suggests that, for volunteers and employees whose work is meant to help another person and for whom sincerity is important, financial awards alone may backfire. A second study, by Gneezy, Meier, and Rey-Biel, shows that an employee or student may think a monetary award implies a task is too difficult, or that they aren’t a good fit for the job. Moreover, a person may feel a financial award demeans them and their efforts. There are times and places for both monetary and non-monetary awards. Deciding which is right for you, your institution, and your people is crucial to the smooth, daily operation of your business. To create custom certificates of achievement, merit, and honor, you need only a computer and printer. Then, you simply download the award certificate, fill in a few fields, and print. 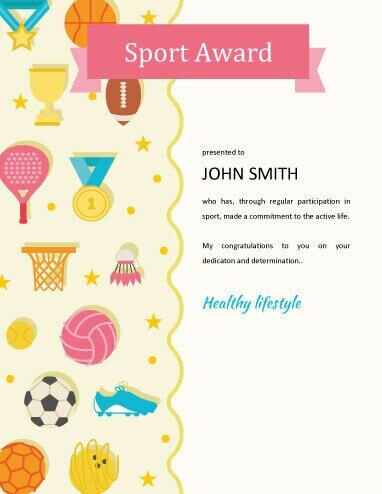 Your award certificate will have a professional design that employees, students, or even colleagues will be proud to display. Certificates of achievement, merit, and honor can be powerful tools when used at the right time and presented in the right way. 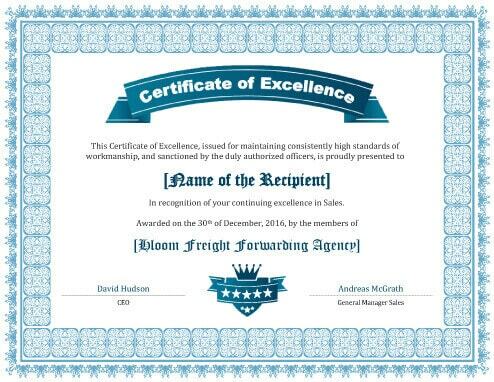 Receiving an award certificate gives a person the warm glow of knowing someone took the time to acknowledge them. And being the person who motivates others can be rewarding, too. Community Service Award – School or work teams often hold community service events. They’re a great way to build team unity while also helping others. 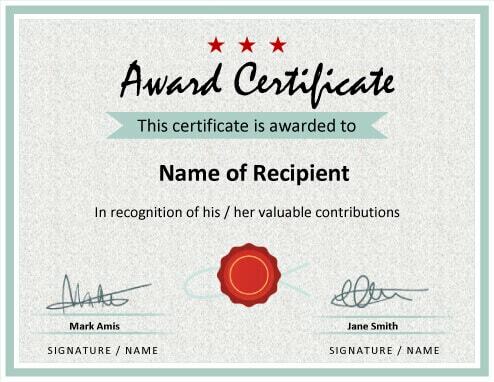 Because this is exactly the kind of activity in which studies have shown monetary awards can backfire, an award certificate provides an affordable yet tangible, “Thank you,” that everyone will appreciate. Great Job – Did your team knock it out of the park on a recent project? Free lunches may be appreciated but quickly forgotten. 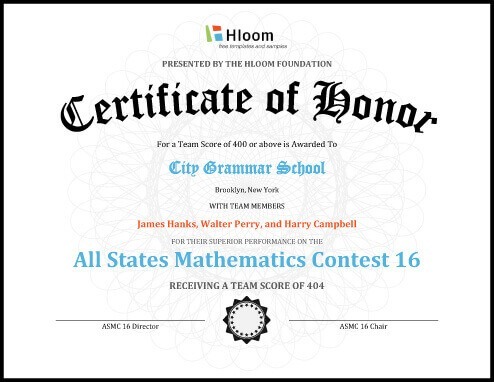 However, a printed award certificate can commemorate your team’s achievement in a way that lasts for years. Good Behaviour – Children love receiving awards. 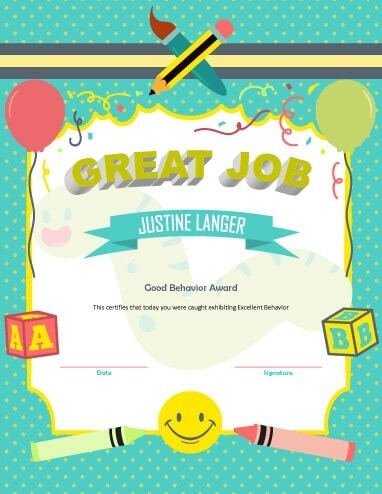 Free printable award certificates provide teachers with an easy and inexpensive way to inspire good behavior. Want to encourage keeping quiet or sitting still during story time? Even the smallest achievements can be celebrated when the associated cost is as low as printing a sheet of paper. Employee or Volunteer Milestones – While working for the same organization for thirty years doesn’t happen as often now as it did in the past, there are still milestones that need to be celebrated. Giving an award certificate and a picture of the recipient with their division leaders (or even company president) can make a lasting impression that ensures continued success. Course Completion – Continuing education is of the utmost importance to today’s employers. Employees can remind others that they’re staying in the game by proudly displaying award certificates to show their accomplishments. Trainers can create a certificate with course titles, dates, and important attendee information. Ready to get started? 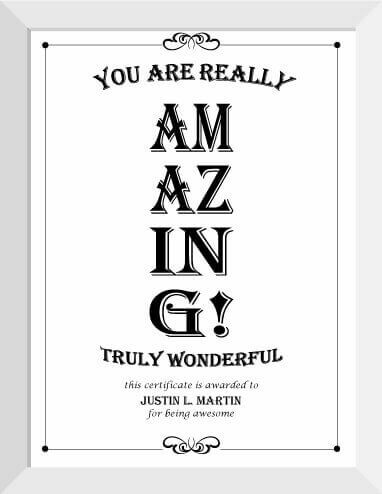 Our free printable certificates are inspiring, professionally designed, and sure to make your recipient smile. Download one (or more) below for free – all they need is your caring touch – no certificate maker to install, no online certificate maker to sign up for. A certificate of merit allows you to recognize another person’s achievements. From gaining competence in riding a one-wheeled vehicle and musical training to accomplishing business goals, there are many reasons to give a merit certificate. Many professions, studies, and hobbies have discrete stages of learning. While a person is on the path to gaining proficiency, certificates of merit can be given to recognize the passage from one milestone to the next. Musical Study – One commonly known area in which certificates of merit are seen is in the world of music instruction. Certificates of merit can be used to show a student’s proficiency as they master an instrument. Accredited colleges and universities use this system to help their students develop. Their curricula establishes the skills needed to advance from levels 1 through 11, and the teachers decide what skill level a student is at. Middle schools, high schools, music tutors, or people giving private lessons can help incentivize their students by incorporating this same model into their training. Hobbies – Some hobbies have ranks that are officially judged by certified testers. Unicycling is the perfect example. A novice unicycler will be able to mount their “nike,” ride it forward a short distance, and dismount “gracefully.” By level 10, a unicycler is able to ride backwards, single-footed, in figure-eight patterns, among many other amazing feats. In between these levels, many other skills are gained and measured. 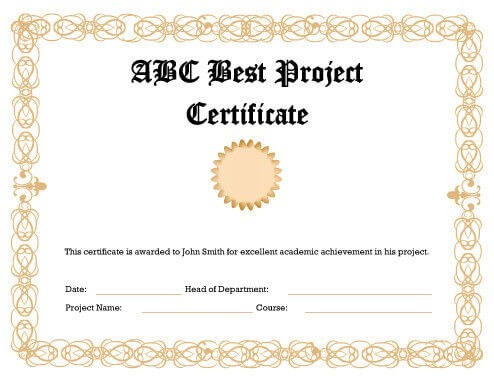 A certification of merit, handed out by an official tester to a student for them to display on their wall, would give them not only a lasting memento, but also a conversation piece. Scholastic Performance – Inherent in every school system is the idea of being tested and judged. However, in many classrooms there are achievements that aren’t fully expressed by grades. Perhaps an elementary student with separation anxiety has learned to walk to class after saying goodbye to their parents. Perhaps a high school student has worked hard on an extra-curricular project. A certificate of merit is an honor that can be displayed on the wall or kept in a memory box for years. 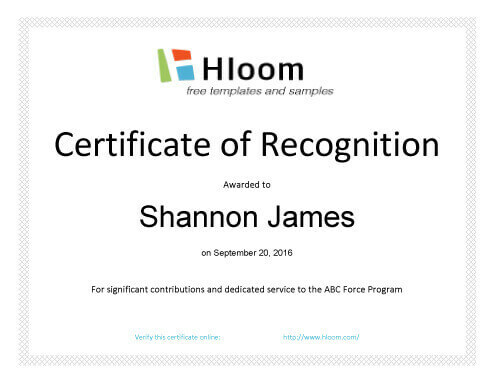 A certificate of honor is an award to acknowledge outstanding service or to recognize a job well done from a community or organization. These award certificates are frequently given for acts of kindness or leadership over months or years of dedicated service. These can be difficult to track item by item, but add up over time. 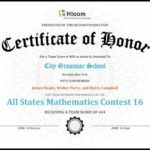 Certificates of honor can also play a role in recognizing important achievements in a variety of fields. 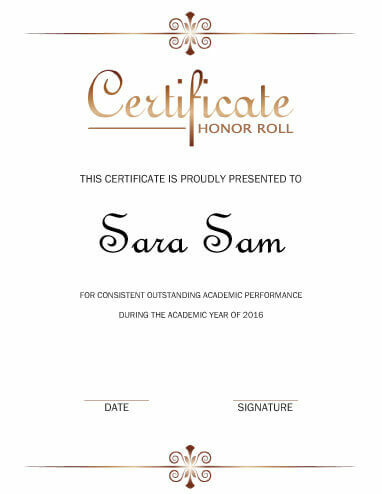 School Honors or Academic Achievements – There is a reason they call it the “honors program” and “honor roll!” An honor roll certificate template can be used for a number of academic purposes, especially when congratulating a student for completing a specific course of study at a certain level. Whether you’re a tutor or preschool teacher, working with students in summer classes or extra-curricular activities, including honor roll certificates in your curriculum shows students when they’ve excelled. This is the kind of positive reinforcement that studies have shown work to keep students interested in learning and feeling good about themselves. Volunteer Work – How can you support a volunteer who has been showing up to your center for years to help out? Volunteers who have worked hard for the community in a non-official capacity deserve to be thanked, but often don’t want monetary awards. While paying volunteers ruins the point of their work, a certificate of honor is a great, concrete way to show your appreciation. 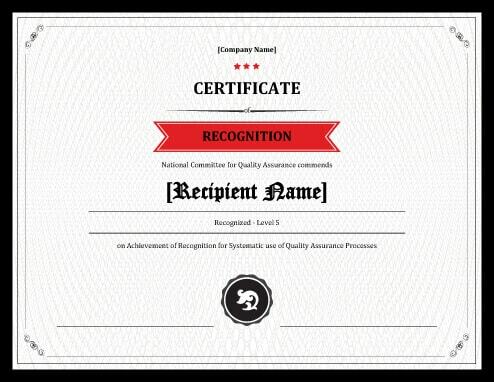 Nonprofit Recognition – While all nonprofits can use certificates of honor, they are particularly popular in churches. Church teachers can use these certificates as simple ways of “graduating” kids who are leaving their classes. The church body or leader can use them to honor an elder or active member in the church, as well. A church can be limited in how it rewards its members, and this certificate allows some flexibility in acknowledging what people have done. 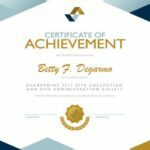 A certificate of achievement is a tool to help you recognize another person’s success. Perhaps they’ve achieved a fitness goal, finished a major project at work, or deserve to be recognized for a lifetime of volunteer work. Everyone loves to be recognized for their hard work and a job well done, and there are times when monetary awards aren’t wanted. As mentioned earlier, multiple studies have shown that, when a person attaches a moral value to their work, they can feel that a monetary award demeans their efforts. In these cases, a ceremony that includes giving them a certificate of achievement may be the best way to say thanks. There are many situations in the workplace when a bonus isn’t appropriate, but a congratulations is. 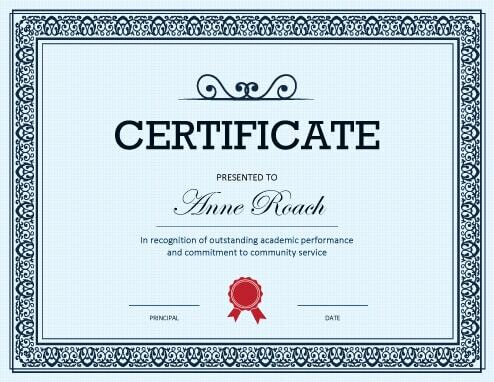 And, at those times, you can use certificates of achievement to help lend extra weight to a program of positive reinforcement. Project Completion – When a big project or a major deal at work is finished, bonuses are often handed out. When these come with little more than a handshake, you can send the signal to your team that your relationship with them is strictly mercantile. Giving bonuses at a small awards ceremony, and handing out certificates of achievement to team members, can help reinforce the ideas of teamwork and appreciation. Continual Advancement at Work – There are times at work when bonuses aren’t appropriate. Completing mandatory training, finishing a job on time, or giving customers positive experiences with your company, for example, are all basic expectations of a job. Giving a monetary award for completing basic requirements, studies have shown, can backfire. However, creating a program of positive reinforcement, where employees are recognized for the work they do, can help lower stress and teach better job habits. Skills Recognition – Has your preschool student learned how to spell her name? Has she memorized her sight words, or read her first level-1 book? Help her celebrate with a certificate of achievement that she can proudly give to her parents. Not only will it help reinforce her self-esteem, but it will also help teach her that learning is good. Plus, parents will adore receiving an achievement award certificate showing their child’s growth. Community Involvement – Does someone in your community stand out for the volunteering work they do? Likely, this person will feel their efforts are lessened if they are offered a financial reward. However, they may love to be recognized with a small ceremony and a certificate of achievement. Military Achievement – Of course the military gives medals and honors for service. But, if you have a soldier in your family coming home—especially if they’ve been recognized by the military with ribbons or medals—then including a certificate of achievement in their welcome home party will give them a memento that they can display on the wall or keep in a memory box.